You need to be in very good physical shape. The fight can easily last more than an hour and will test every bit of your strength. If you have any physical weakness, it will be exposed. Even professional athletes claim it is the hardest thing they have ever done. You need to have significant experience fighting big fish in stand-up gear. Perfect technique is critical. Any mistake might cost you the fish (or more). Anglers who have never fought stand-up should NEVER do this. This is not the place to learn and they will not enjoy the experience (stick to the chair or gunnel rod holder). The angler needs to be prepared by use their hands to add additional drag pressure on the spool especially when the fish is close to the boat. A good pair of tight fitting gloves are needed. Gloves with synthetic palms or fingers will simply melt and be useless by the end of the fight. We are still searching for the right gloves. The angler needs to preserve their strength for the second half of the fight. Once these fish get close to the boat, the fight becomes twice as difficult. The angler needs to be prepared to move quickly across the stern to keep the line from going under the boat or touching the gunnels. There is no way for the captain to move the boat quickly enough. The angler must be be confident enough to increase the drag to the point where it can actually slow the fish down. This means they need to lean back and hang on during big runs. Giant bluefin tuna runs are typically not long, but the power is incredible. 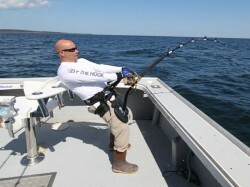 In the final stages of the fight, the angler will need to use their hands to lock the spool when pulling the fish up through the water when they circle under the boat. If you can’t or won’t do this, you can’t bring the bigger fish up high enough to where the mate can leader them. You can’t just push the drag to full, because you need to be able to let the tuna take line if it makes a sudden late run. If not, be prepared to get wet. Anglers should always bring their own fighting belts and harnesses (required). We strongly recommend the Black Magic fighting belt and harness with an XL wide Black Magic plate. The XL wide plate is critical because you need to have a broad stance (legs apart) to maintain your balance. If you have questions about fighting giant bluefin tuna, please contact us. Giant Bluefin Tuna - Up to 1000 lbs!